Bus Rental: What Makes A Minibus? If you are looking to charter a vehicle for your next upcoming event, having everyone ride together can make quite the party! 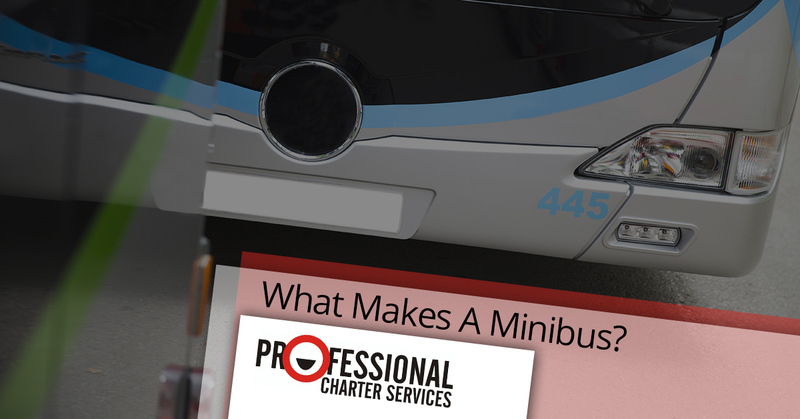 One of our customers’ favorite options, here at Professional Charter Services, is the timeless minibus option. But you might be wondering, what exactly is a minibus, and is there any difference between a minibus and a typical van? The answer, as you’ll see in this blog post from our bus rental service in San Francisco, is that there’s nothing quite like a minibus for comfort, usefulness, and pure fun! So without further ado, here’s our take on what makes a minibus a minibus. If you’ve ever crawled into the back row of a 15-passenger van that was full to capacity, you know what we mean when we say that bench seats just aren’t very nice. Being in in the cramped quarters of one of the bench seats of a van is bad enough when you’re with people you know and like, but it’s even worse when you’re packed in with strangers (or people you only remotely know, like that coworker named Bob who works in another department). And the longer your trip, the worse it gets. Instead of that, choose to rent a minibus, whose individual captain’s chairs are comfortable seats designed for with actual human beings in mind. Instead of packing three people onto a bench seat that scrunches you in, your minibus puts an aisle down the middle to allow for there to be one seat on one side of the aisle and two seats on the other. That way, no one has to suffer through with the middle seat, but everyone gets a window or an aisle. Does anyone like rubbing shoulders with other people on a prolonged basis? When you think of riding in the back of a crowded van, does the smell of that experience rise immediately to your mind? Does it make you feel claustrophobic and slightly nauseous to ride in the bumpy back of a van with no chance of escaping to get close to a door or window, even if you launched yourself over the seat backs? Yeah, we get it. Riding in a stuffy van is no fun. There’s horrible ventilation, cramped quarters, shock absorption that will make your head almost hit the ceiling when you go over a railroad track… you name it, the perfect recipe for claustrophobia is in that van you were thinking of renting for your trip. Think again—get a minibus, where everyone has their own individual seat and shoulder belt, the ceiling is much higher to allow people to move around more easily, and the ventilation and air to circulation is much better. No matter what kind of event you’re planning to drive folks to, going in a minibus is a sure way to get the party started early. Now that people are comfortable and not jammed in between their neighbors, you’ll have the perfect setup to get everyone laughing at the hilarious party games that you can play in a vehicle. Whether you’re playing a game that uses your wits, the sights out the window, playing cards, or some other concept, the minibus will let the party begin! What are you waiting for? Get your minibus rental today from Professional Charter Services.